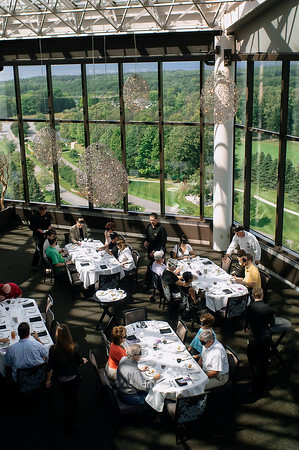 Servers drop off the appetizer round for 20 participants during Dining in the Dark at the Taste of Traverse City event at the Aerie Restaurant and Lounge on Saturday. "People usually rush through their meals. (Blindfolding) gives them a chance to slow down, be curious about what's in their food," Carol Lewis, the producer of Taste of Traverse City, said.